Heat 2 tbsp of oil in a large pan over moderate heat. Add chopped garlic and shallots, then sauté for a minute, taking care not to burn garlic. Add chopped tomato, basil and parsley, salt and pepper, cover and simmer for about 15 minutes checking and stirring the sauce. Pour the mussels in a large saucepan and throw over 2 tbsp of oil, a clove of garlic and acup of wine. Cover tightly and cook on high heat for about 3 minutes, till the mussel shells open. Eliminate those that haven’t opened. 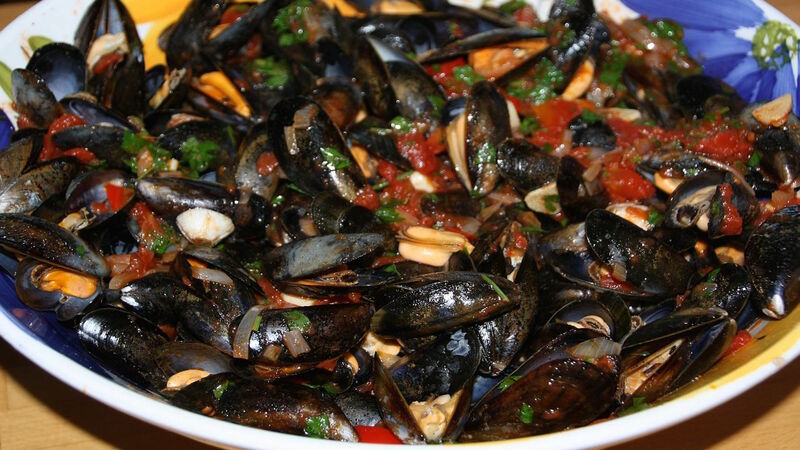 Add tomato sauce to cooked mussels and cook over a high heat for 3 minutes, giving a few energetic stirs. Serve your mussels in soup bowls, garnish with chopped parsley and freshly ground black pepper, accompany with some crusty Italian bread or plain Bruschetta slices, rubbed with garlic and oil.